New film or television adaptations of A Christmas Carol arrive every year, and Hollywood sporadically mounts lavish big screen versions. There have been modern takes (Scrooged), motion capture takes (Jim Carrey in 2009’s A Christmas Carol), muppet takes (Michael Caine – singing! – in A Muppet Christmas Carol). But the definitive version, thus far, remains this British production. 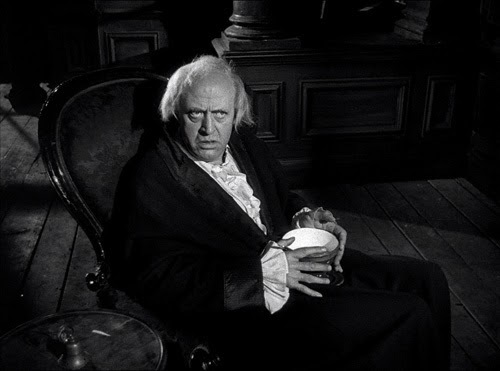 And the reason is simple; Alastair Sim’s masterful performance as Ebenezer Scrooge is unbeatable. Sim, an actor blessed with the visage of one who has spent a harrowing night in a graveyard, was one of Britain’s great comic actors. He was one of a select few performers, Terry-Thomas being another, whose mere presence in a scene was a recipe for gales of laughter (so it’s a particular treat when both appear in the same film; see School for Scoundrels and The Green Man). Sim was an extremely versatile actor, but his expressive mug, a gift to the exaggerated reaction shot, ensured he was cast mainly in comedies. Even when he appeared in dramatic vehicles he invariably took the role of the eccentric or the comic relief (Green for Danger). 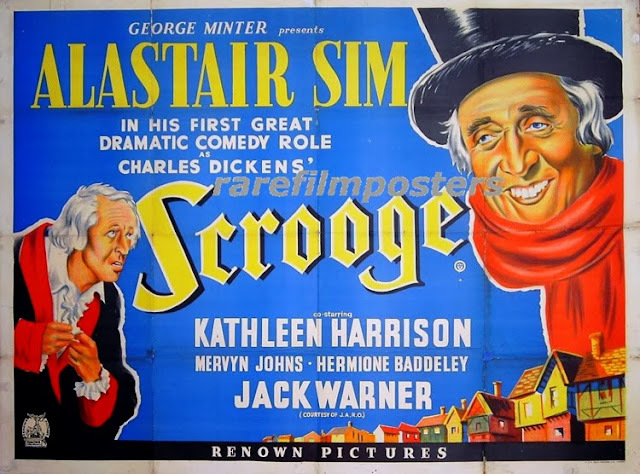 So if you know Sim’s work, watching Scrooge is as much about the anticipation of his transformation from miserly misery-guts to benefactor of boundless brio as it is watching a classic tale well told. The last 15 minutes are a joy for that very reason; the despair and foreboding disperse and Sim throws himself into the aspect of a man reborn. 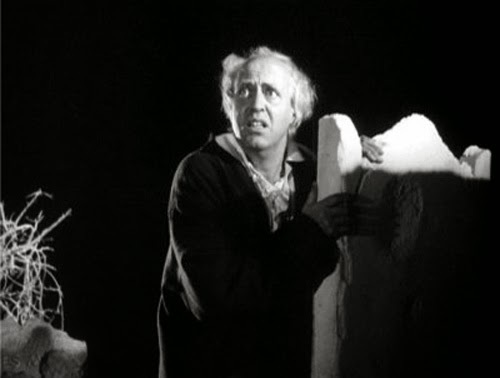 But even during the opening stages, his version of Scrooge displays a wily energy that few have matched. Often actors playing the role merely make Ebenezer dry or bitter, infecting the proceedings with an overly studied quality. Here, we see his witty exchange with a man to whom he has lent money (and who is requesting a stay of repayment). Scrooge expresses wilful mystification over why the man’s wife might end up in debtors’ prison when it is the man who did the borrowing. His rebuke of “Be off with you!” to a cherubic beggar singing on the street is mean but funny; in another version it would merely be mean. Scrooge: If they would rather die, they’d better do it and decrease the surplus population. A line such as the one above is delivered with a macabre relish, making Scrooge’s later reaction on having it repeated back to him all the more potent. His shame over his words is now palpable. Familiar Dickens lines (“There’s more of gravy than of grave in you”) sound fresh when delivered by Sim. 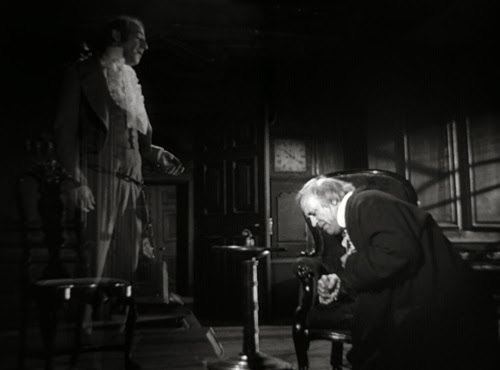 The impact of the arrival of Marley’s ghost rests almost entirely on Scrooge’s wild-eyed fear. Michael Horden makes for a suitably tormented spirit Marley, although his chains look like a little as if they were made from cardboard. This version spends considerably more time with the Spirit of Christmas Past (Michael Dolan, who makes little impression), and we visit a number of additional moments in Scrooge’s life. Aspects of the story have been changed (Scrooge’s mother dies giving birth to him, rather than his sister; this serves to more clearly inform the rejection of his nephew when she too succumbs in childbirth) and there are some notable additions. 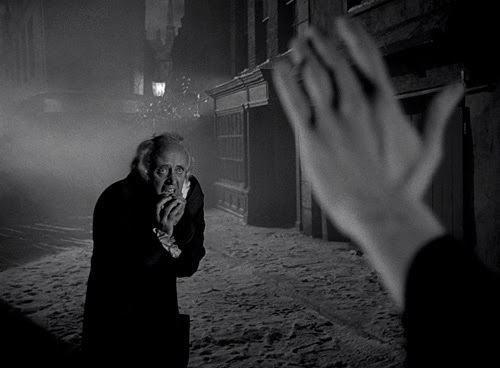 We see the death of Scrooge’s sister (he does not stay to hear her final wishes) and his first encounter with Marley. 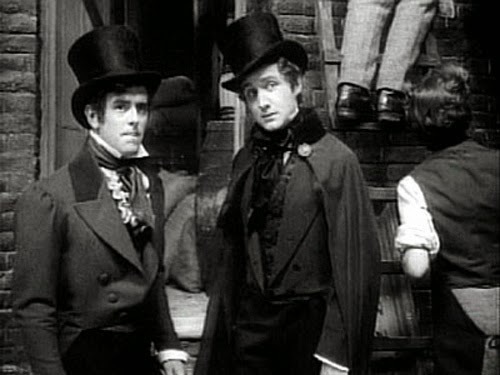 Unsurprisingly, young Scrooge is played by Sim protégée George Cole (I wonder if Cole was considered for Bob Cratchit; he was probably considered too young). Young Marley is future John Steed Patrick Macnee. Another addition is Scrooge’s visit to Marley’s in his deathbed. Then there’s the character of Mr. Jorkin, who employs Scrooge upon leaving the service of Mr Fezziwig (Carry On star Hattie Jacques can be briefly seen as Mrs Fezziwig). He’s played by future Dixon of Dock Green Jack Warner. 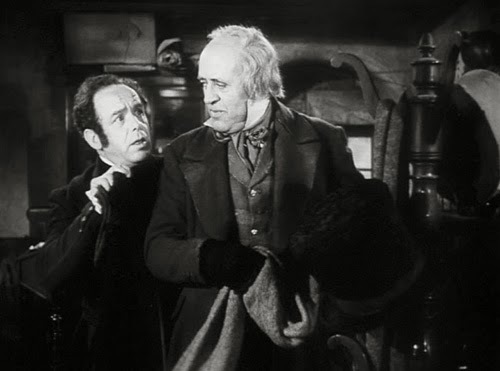 Particularly strong is the scene where a jocular and unrepentant Jorkins is charged with embezzlement and Scrooge and Marley offer to pay off his debt in return for control of the company. Francis de Wolff, who might be best described as his generation’s Brian Blessed, is much more memorable than Dolan as the next Spirit (of Christmas Present). 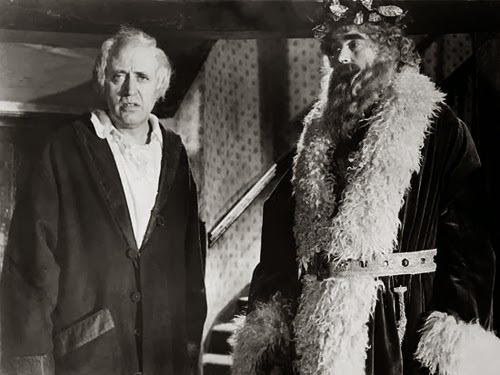 Booming of voice, full of beard, and wearing what appears to be a Father Christmas outfit (except that Ignorance and Want sit miserably under his coat), he conducts an increasingly remorseful Scrooge on a tour of those he has neglected or left behind (his nephew, his once-betrothed Alice, the Cratchit house). The drawback of this section is that we’re subjected to an overdose of Tiny Tim, never the subtlest of Dickens characters. The precocious little angel is laid on with a trowel here, and Glyn Dearman is much too tall for epithet “Tiny”. The scenes in this section lead to a few unanswered questions; since Alice is apparently devoting her life to helping the less fortunate in the workhouse (rather than married), and the coda shows us a now fit and healthy Tim some time after the events of Christmas Eve, it’s curious that Scrooge isn’t shown reconciling with her. The maudlin well-meaning of the Cratchit household (I’m sounding like Scrooge now!) is part-and-parcel of any retelling of the story, although it’s notable that, for all that Scrooge is a curmudgeon, he is paying Cratchit for Christmas Day even though he isn’t working. The Spirit of Christmas Yet to Come (C Konarski) is of the familiar cowled variety, and these scenes economically contrast grief over the loss of wee Timmy with the indifference to Scrooge’s passing. 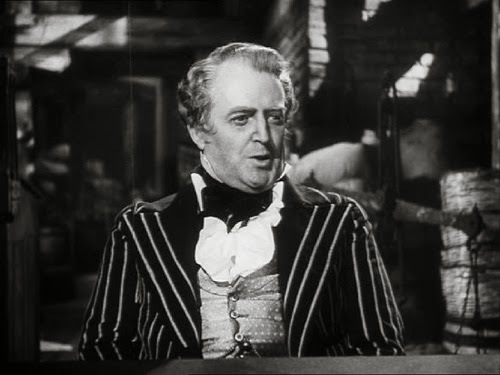 Peter Bull, also the narrator of the tale and furnished with a face for inflamed villainy, appears as a businessman offering to attend the latter’s funeral “If there’s a lunch provided”. Scrooge: I’m as merry as a schoolboy. I’m as giddy as a drunken man. When Scrooge awakes a new man on Christmas morning, Sim is firing on all cylinders. 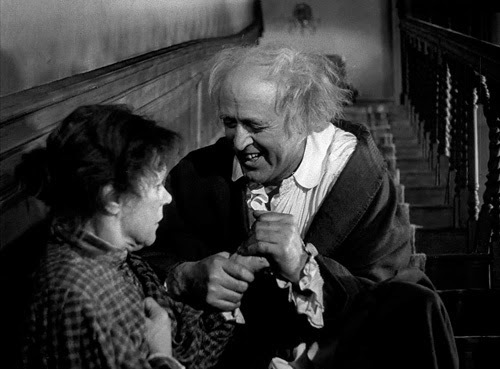 The interplay between Scrooge and Mrs Dilber (Kathleen Harrison) is delightful, as she becomes increasingly unnerved by her seemingly unhinged employer (who attempts headstands on his chair) and he is ever more amused at her fright. Then, to crown it all, when he visits his nephew Fred (Brian Worth) Scrooge throws himself headlong into a spirited polka. His elation is infectious (“I don’t deserve to be so happy”) and only the humourless soul would be unmoved by his wild abandon. Brian Desmond-Hurst directed from a screenplay by the appropriately named Noel Langley (one of a multitude of writers who worked on The Wizard of Oz; Langley was, at least, one of the ones who was credited). The black and white photography serves the mood of the piece. Scrooge’s house resounds with a sombre, haunting atmosphere and the scenes of snowy Victorian streets have polish belying what was most likely a small budget. If Desmond-Hurst generally brings little in the way of flair to the fantasy elements, this is a minor quibble; all eyes on Sim. 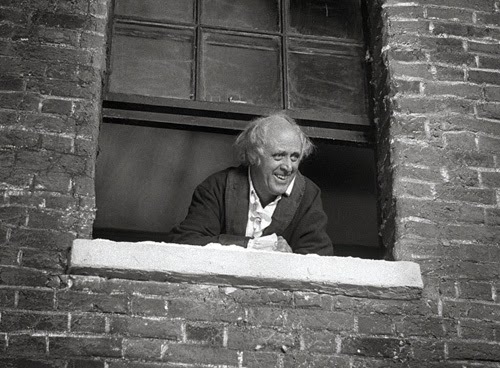 (Still, there’s the occasional arresting moment; the simple kaleidoscope of woeful souls Scrooge is shown from his window). Sim’s Scrooge is one of only two or three versions I’ve revisited time and again. What it lacks in forward momentum it more than makes up for with a sparkling central performance. It’s surely no coincidence that Robert Zemeckis’ recent version takes its cues from this one. Unfortunately, while all the pixels money can buy have been thrown at it, it lacks heart. Sim will convince you his Scrooge’s is full to brimming.